“As we announced on September 4, weakness in the global economy constrained revenue growth at FedEx Express during our first quarter and affected our earnings,” said Frederick W. Smith, FedEx Corp. chairman, president and chief executive officer. FedEx is to some considered a bellwether for economic growth and activity, both here and abroad given that the company ships products and packages around the world. To an extent this makes sense and so the chart of the day by Bloomberg Brief had to deal with FedEx shipments and U.S. economic growth (HT to Tim Duy, and FT Alphaville). If you haven’t see the graph then follow the FT Alphaville link to see it. Clearly there is not a perfect 1:1 relationship – nor is there ever – however there is a strong correlation in year-over-year growth rates. The only problem is that FedEx’s fast (overnight) delivery has been in a structural change in recent years, thus making the signal harder to extract from all the noise. As reported in Bloomberg’s Businessweek, this is an issue that the market and the company itself is aware of. Now, that doesn’t mean that their figures are not useful in the short run and the reasons FedEx cite for their downgraded outlook are the same that most analysts and economists have been citing recently as well. Mainly the global manufacturing slowdown, which obviously means less packages being shipped. Now, the manufacturing slowdown is worrisome and the story told is certainly believable, however when stepping back and looking at FedEx’s shipments as an indicator, I am less convinced by the data than by the reasoning. 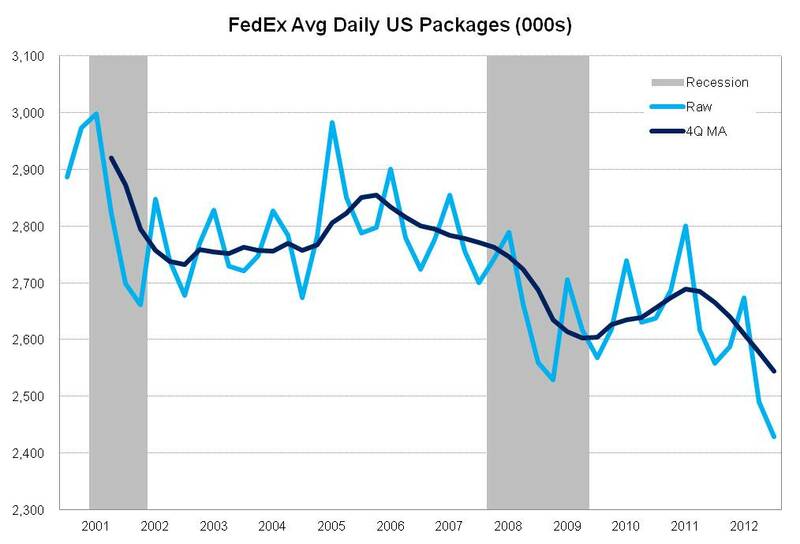 The graph below shows FedEx’s average daily packages shipped in the U.S. since 2001. Note that this is the same measure used in the Bloomberg Brief chart, just in levels and not growth rate. There is clearly a structural change taking place coupled with a business cycle component, making a useful reading of the data problematic. The changes seen in the past 5 quarters, using the four quarter moving average values, is -5.2%. During the recession – from 2007q4 to 2009q2 – the same measure declined 5.8%. I don’t think anyone would argue that today’s economic environment is anywhere near that seen during the financial crisis and associated economic free fall. To be fair, FedEx shipments were declining since 2005 so calculating a precise recessionary measure is difficult however using the NBER dates does provide a defensible and reasonable calculation. In conclusion, yes, the global manufacturing slowdown is worrisome as business investment and exports have been two bright spots in the economic recovery. Putting our economic drivers at risk is problematic, however, the manufacturing cycle had to slow down at some point. More importantly there are now other portions of the economy showing signs of life, chief among them is the housing sector and this manufacturing to housing handoff is something we’ve written about before. Global growth is slowing overall, or at least the outlook has been downgraded, however this latest piece of news from FedEx fits more into this overall picture rather than being anything new or unexpected. FedEx data is available here. Posted in Miscellaneous, News | Tags: average daily, business, downgrade, economic outlook, Economy, Federal Express, FedEx, global, Growth, manufacturing, packages, shipments, shipping, transportation, U.S.